Most of us have had an experience at some point in our lives of being so immersed in art making that we lost track of time. This happens because creative activities ease us into a process of focus, concentration, absorption and flow, which is the same process we experience when we’re meditating. This is why drawing, painting, colouring, photography, art journaling and writing are naturally mindful. If you've no meditation experience, or find it hard to calm your mind or sit still and meditate, then creative activities are a wonderful way to enhance your capacity for focus, concentration, inner peace and calm through this natural mindfulness. In traditional mindfulness meditation we develop awareness of the breath, the body, thoughts and emotions, making them our focus. We become aware of what our experience is right in the very moment we’re experiencing it. When we combine this steady, kindly, embodied awareness with naturally mindful creating then we are practicing creative mindfulness. Adding moment by moment mindfulness to our creativity helps us to just enjoy the process rather than focusing on end results, which means we draw, colour, write, journal or paint more freely and more joyfully. When we practice mindfulness whilst we’re actually in the process of creating we are also able to befriend and gradually change the habits of negative self-talk, inner criticism, perfectionism and self-doubt that often cause us to feel creatively blocked. By bringing first a curious, lively awareness, and then a kindly, gentle attitude to what we’re making, we can change how we relate to ourselves, our creativity, and the world around us forever. Creative mindfulness is for everyone - absolute beginners who've never meditated or who've not created a thing since school, as well as experienced meditators and professional artists. Why not listen to this short podcast to find out more? I’ve been creatively blocked for so long and I really wanted to do something about it. This feels like it’s given me a little opening which I can take home. Quite profound. I've been doing mindfulness in general but was stuck creatively. I didn’t think of using my mindfulness with this creative block. I was very happy to have the opportunity to break though this block!!! Thank you. Opened up different ways of seeing and inspiration. It inspired me to go home and play. This filtered through to daily tasks too. It was freeing to do something without focusing on the outcome but on the process. Liberating and a real breakthrough for me. A wonderful teacher. The course helped me to connect with myself, to drop the internal critic and just BE, not to worry about whether it was good enough, or what other people thought – just to drop all that anxiety and do it without judgement. How can we be more mindful of our thoughts when we meditate? Perhaps one of our most common preconceptions about mindfulness meditation, is that somehow our heads will become an oasis of stillness, calm and tranquility, rather than the over active, preoccupied or even anxious things they often are. What we soon realise is that mindfulness practice doesn't stop us from thinking, but instead offers us a new way of relating to our thoughts. "Neither from nor towards, at the still point, there the dance is." T.S. Eliot And there the art is... Neither grasping after it - it's gotta happen, gimme gimme inspiration. Chasing chasing. Nor expecting inspiration to come strike miraculously out of an empty sky. Instead we hold steady, hold still. We show up. Thank you for following my blog. In future you'll get each new blog post direct to your inbox. Watch out for your subscription confirmation email. It may go to your Promotions, Social or even your Junk folders, so do check there for it if you can't find it. We all need community. It's so much easier to meditate with others to support us. And making art with friends is a great way to stay inspired. So wherever you are, I'm inviting you to join our friendly, supportive Art of Mindfulness community in the following ways. Sign up for the monthly Art of Mindfulness community eNews. Guided meditations, podcasts and blogs direct to your inbox. You'll get the FREE 3 Challenge eCourse as a welcome gift too. Like social media? Then why not post your mindful art, drawing, photography and writing on Instagram using the hashtag #stoplookbreathecreate - you'll find lots more of us doing it daily too. Want a little privacy? 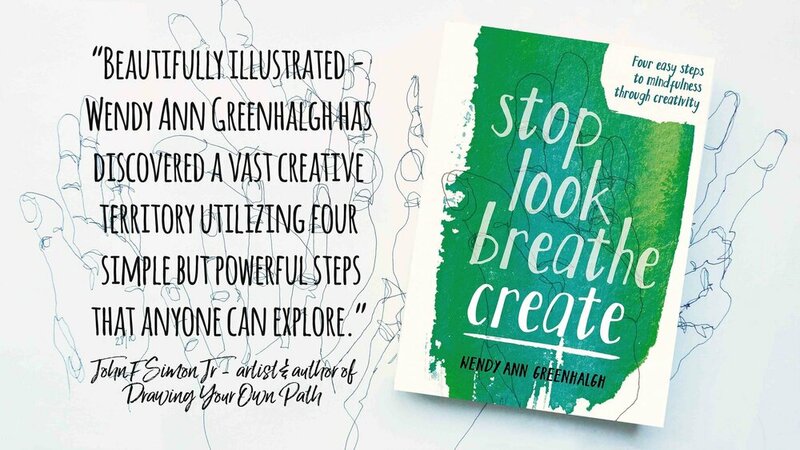 Then join our closed Stop Look Breathe Create Facebook Group - it's the place for you to chat, ask questions, share your own mindful creativity and enjoy other people's too. Want more inspiration? Then follow me on my Facebook page where I share my own #stoplookbreathecreate practice and daily links to the best articles on art, creativity and mindfulness. You can get the Art of Mindfulness community eNews here too. Welcome to the Art of Mindfulness community. Watch out for your subscription confirmation email and FREE mindful art course, the 3 Challenge. My emails may go to your Promotions, Social or even your Junk folders, so do check there for them if you can't find them. I practice Stop Look Breathe Create every day of my life - and I share my mindful photography, drawing and writing on Instagram and Facebook - so do come and say hello. All you need to do is click one of the social buttons below my art.